Underwear For Men makes the most comfortable mens underwear for athletes and weekend warriors. Our adjustable pouch underwear is designed to effortlessly isolate, comfort and support your manhood. Underwear For Men is the only brand of men’s underwear that offers both isolation AND support. While our underwear product has many uses, our game changing men’s underwear was originally designed for sports. Every pair of briefs and boxer briefs are intricately engineered for performance and feature the same US patented and Intl patents pending technology. Our briefs and boxer briefs are worn for all kinds of athletic activities including, working out, running, cycling, hiking, triathlons, golf, basketball, soccer, yoga, hunting, camping, canoeing, fishing and more. No matter where you are with your fitness game, UFM Underwear will cool, comfort and support your most precious assets. Check out our reviews on every page of our website. Too often, men experience painful chafing which sidelines them from all activities. With Underwear For men, men no longer have chafing issues. The customizable pouch offers complete isolation and support, and eliminates skin-on-skin contact. Our soft, lightweight materials stay cool and dry fast. Men who are active and play sports have longed for an athletic underwear that replaces the jockstrap and compression shorts. The jockstrap was invented to provide comfort and support for bicycle jockeys, but there is nothing comfortable about wearing a jockstrap. While some men opt for compression shorts, they just end up smashing everything into a sweaty, bacteria-rich mess. Our adjustable pouch underwear does what jockstraps and compression shorts fail to do. The US patented and Intl patents pending underwear has a jockstrap built in that isolates and supports in a soft, breathable pouch. The streamlined tailoring prevents rubbing and chafing. Men who like to lift weights, men with large thighs or men with longer legs like to wear our boxer briefs with a 9” inseam. Many runners like to cut out the liners that come sewn into their running shorts due to lack of support and opt for wearing briefs or compression shorts. If this is a familiar story to you, try wearing Underwear For Men on your next weekend run. You will quickly find that UFM is built for speed and made to last. Our men’s underwear was designed with a unique tapered leg so it doesn’t roll up as you run. Too many options either move as your legs do or they compress your legs too much. In addition to boxer briefs, we also manufacture a men’s brief. Because many popular fitness regimes require you to move in a number of ways, you need underwear to stay in place with squats, bends, pulls, runs, and more. All styles of Underwear For Men suit guys as they workout and on long distance runs. Pouch underwear is designed to provide isolation and support. Unlike other pouch underwear, the UFM pouch doesn’t come presized. Our US patented and Intl patents pending pouch adjusts to each man. The soft, breathable fabrics are made to wick sweat and cool. 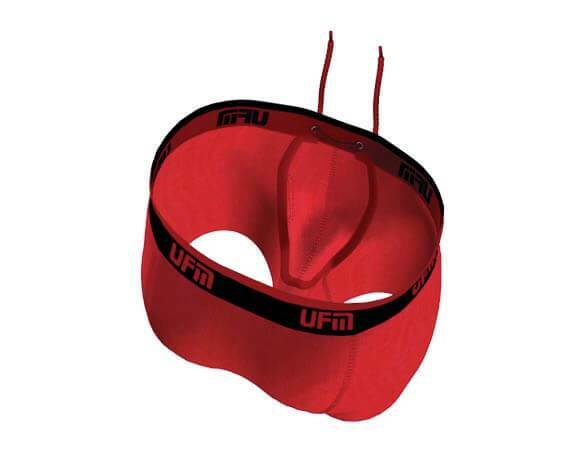 So stylish and comfortable, some men like to run in their UFM underwear. Skeptical? We’ve earned more than 3000 five-star reviews from satisfied customers. Click the reviews tab to the right to read comments from real customers. How to Choose Your Underwear Size: IMPORTANT- UFM Underwear is sized to fit your waist.